The universally renowned Ailey II—Alvin Ailey American Dance Theater’s second company—will stop in Lafayette for three days of activities that culminate in a public performance at 7:30 p.m. on Wednesday, February 13 at the Heymann Performing Arts Center. The company will also offer master classes, a lecture demonstration and a 10:30 a.m. daytime performance for students at the Heymann Center. 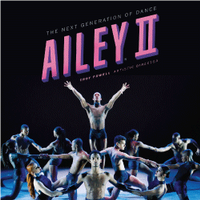 Tickets for Ailey II’s February 13 performance are available through www.TicketMaster.com.